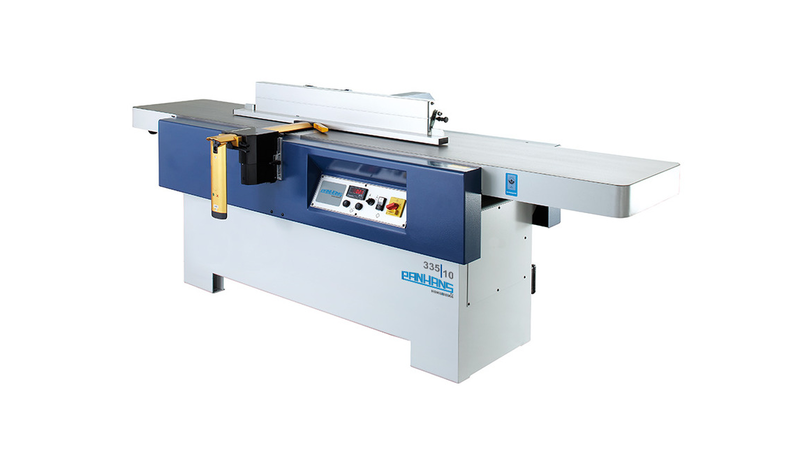 The surface planing machines 334|10 (410 mm planing width), 335|10 (510 mm planing width) und 336|10 (630 mm planing width) are characterised by the extremely smooth and quiet operation of their dynamically balanced cutting head. The maintenance-free structure of the bearing with high performance precision ball bearings guarantees lifelong durability. The fine-planed grey cast iron tables with a total length of 2,850 mm are stored without undergoing vibrations and guarantee a perfect planing result. The control elements for the electromotive height adjustment with a digital display for the chip depth adjustment have been functionally arranged. The hollow and pointy joint can be precisely set via the hand wheel at the outfeed table. The planing fence made from a thick-walled, anodized double chamber stop profile can be altered easily and continuously adjusted up to 45°. The integrated auxiliary stop can be easily folded up and down without the use of tools and for immediate application.